Browse: Home / 2014 / December / Sci-Fi This Week: The Flash Versus Arrow Crossover! 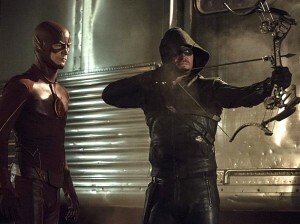 Sci-Fi This Week: The Flash Versus Arrow Crossover! The DC universe on The CW is just about the coolest thing going on in sci-fi and fantasy fandom right now, and this week it’s going to get epic. The two popular comic book shows are going for an all-out crossover event, as Oliver and Team Arrow come to Central City on Tuesday and then Barry heads to Starling City on Wednesday. It’s Flash versus Arrow! Also this week: Haven makes its fall finale on Syfy (it will be back next fall with the second half of Season Five), and TNT debuts a brand new show with The Librarians this Sunday night! Noah Wyle (Falling Skies) guest stars as Flynn Carsen, the original librarian, who now has a team led by Eve Baird (series lead Rebecca Romijn). 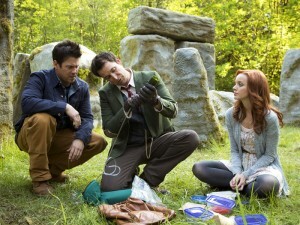 Scroll down to watch the trailer for The Librarians. 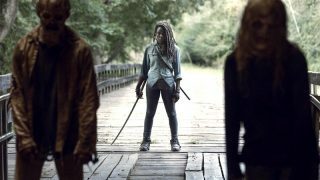 It will be a double-episode premiere, starting at 8/7c. GOTHAM (FOX, 8/7c): Catch a repeat of the pilot episode. “The Akeda.” Unforeseen sacrifices must be made and loyalties are put to the ultimate test in the fight against evil. “Flash vs. Arrow.” Oliver, Felicity, and Diggle come to Central City to investigate a case involving a deadly boomerang. 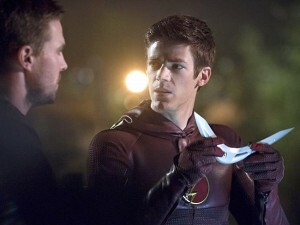 Excited about teaming up with his friend, Barry asks Oliver if he’d like to help him stop Ray Bivolo, the meta-human Barry is currently tracking. When Bivolo infects Barry and sets him on a rage rampage, everyone is in danger, and the only one who can stop him is the Arrow. “… Ye Who Enter Here.” S.H.I.E.L.D. discovers the ancient city before Hydra, but uncovering the secrets may require one of Coulson’s team to make the ultimate sacrifice. Meanwhile, May and Skye race to get to Raina before Whitehall takes her. “The Brave and the Bold.” Oliver, Arsenal, and Diggle track down the location of a boomerang-wielding killer named Digger Harkness but are surprised when they come face to face with an A.R.G.U.S. team. 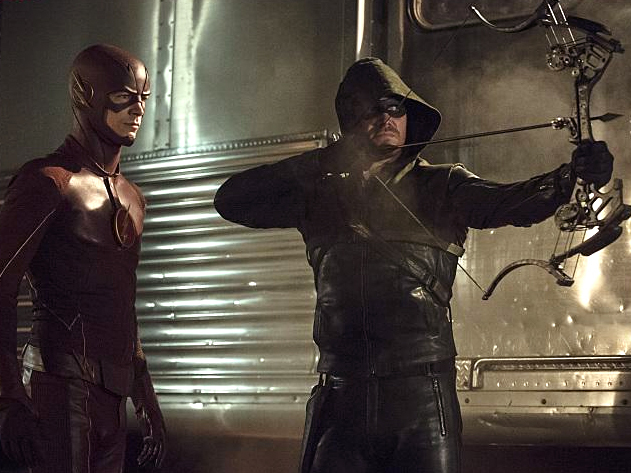 The Arrow joins the fight and gets help from an old friend — the Flash. 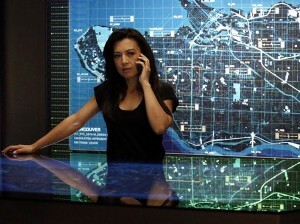 “Fog of War.” Tensions run high between Clarke and Finn, while Raven discovers that Mount Weather is interfering with their communication systems. Meanwhile, Jasper and Monty discover the truth about what’s going on at Mount Weather and Octavia comes face-to-face with her worst nightmare. “Chosen.” The revelation of Mara’s endgame spurs Audrey and Nathan to pursue a plan to stop her once and for all. 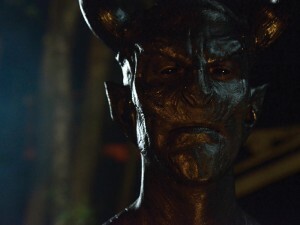 “The Grimm Who Stole Christmas.” Nick and Hank are called to investigate a bizarre string of home invasions that lead to an even stranger Wesen phenomena. Monroe has a very special Christmas surprise in store for Rosalee. Meanwhile, Truble comes to a life changing realization that will affect everyone. “Shattered Sight.” Storybrooke is in a state of chaos with all the residents under the Snow Queen’s Spell of Shattered Sight at each other’s throats. Emma and Elsa race against the clock to free themselves of the ribbons and take down the Snow Queen and her curse. Meanwhile, Gold gathers Belle and Henry as he prepares to leave town forever, and Will Scarlet looks to square his tab with Hook. TNT, 8/7c – SERIES PREMIERE! “And the Crown of King Arthur.” A mysterious someone is killing potential librarians in the premiere of this series about a group trying to protect the world’s mystical treasures. “And the Sword in the Stone.” The Serpent Brotherhood sets out to return magic to the world. “Aftermath.” Arcadians mourn the loss of a beloved member of the community. The stem cells from Rachael’s baby do provide the cure for the virus, but when Rachael suddenly goes missing, Bellamy and Maggie turn to an unexpected source for help. Henry learns the truth about Margaret and his family’s role in the factory fire.